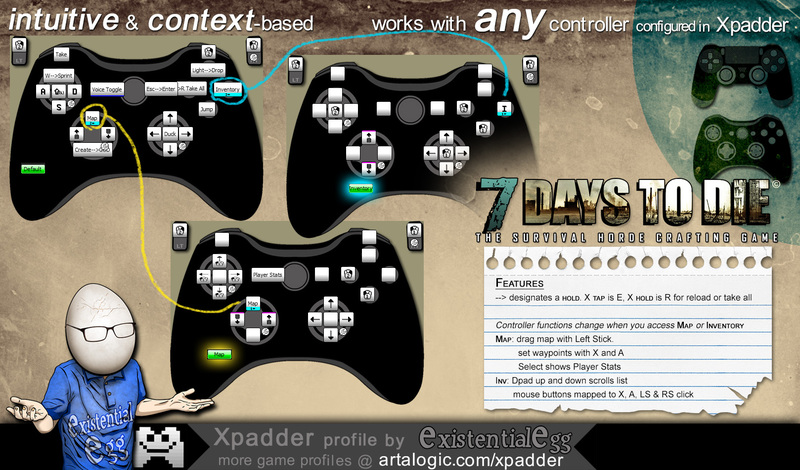 Xpadder Forum • View topic - 7 Days to Die "Get diarrhea from your couch"
7 Days to Die "Get diarrhea from your couch"
Re: 7 Days to Die "Get diarrhea from your couch"
Inventory should be O on ps4 controller.... I use a DS4 controller. Sounds like maybe your controller isn't mapped properly in Xpadder. Thank you ExistentialEgg! Looks like you put a lot of work into giving us these profiles. Thanks again bro! I just bought this game on sale on steam. I forgot to check here first to see if there was a profile . And Mr Existential Egg has come through again ,, Thanks muchly !! You're welcome! Let me know how it works out. I haven't played the game for awhile so I'm not sure if new controls were patched in that I need to add to this. Being stuck in Sprint/sneak run: Again, I'm a moron, you just barely move the left stick to move slow, push it farther to run, brilliant. My current frustration is navigating the inventory screen, moving reliably from cell to cell, does xpadder let you set a absolute cursor position, then a predefined cursor movement increments where you can use the D-Pad to move from square to square? TLDR: Your profile is brilliant, but I didn't like it at first because I didn't RTFM. I don't believe you can do that in Xpadder (for inventory). I've looked into that also. I've tried snap positions, different sensitivities and other tricks but nope... couldn't quite get it right. I DID have inventory be a separate set in this profile with a different mouse speed setting to try and make it easier. And yeah, some of my profiles are a little complicated but I always try to have things makes sense contextually, like with right stick forward all the way being sprint. hah! i didn't even notice that the mouse speed had changed (obvious now that i look for it). Again, brilliant work, didn't mean to imply otherwise. I still have *much* to learn about xpadder. Thanks for the reply and all the effort. if you are curious to learn, THIS: viewtopic.php?f=180&t=3137 goes over a lot of the more advanced things you can do in xpadder. I learned by studying other profiles and reading up on that.